After President Donald Trump took the oath of office on January 20, everyone began wondering what he'd do in his first 100 days -- and how he'd put personal touches on the People's House. 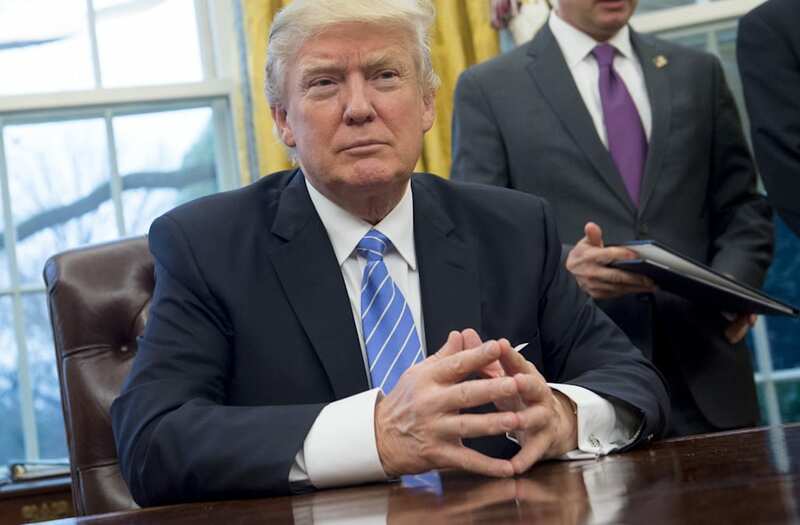 First off, when photos of Trump signing an executive order in the Oval Office surfaced, everyone noticed that the curtains hanging behind him were gold (as suspected). ABC also reported that the president brought Winston Churchill's bust back to the White House (after President Obama had replaced it with one of Martin Luther King, Jr. during his presidency). Trump hasn't done away with the MLK bust, though (scroll through the gallery below to see advisor Kellyanne Conway standing next to it). Furthermore, the rug Obama had selected (with quotes from MLK and former presidents) was replaced with a gold one Laura Bush had designed during her husband's presidency. Onto the food, though (priorities, people). According to the New York Times, Trump has decided to stock his kitchen with Lay's potato chips (which isn't a huge surprise, since it was his snack of choice on his private plane, as well). Ronald Reagan loved his jelly beans and not just the average grocery store brand. The 40th president of the United States stuck to a higher-end Jelly Belly brand. And who couldn't get enough of pigs in a blanket, fried chicken and coffee with extra sugar? That would be the 26th president Theodore Roosevelt. The longest running president in history, Franklin D. Roosevelt, favorited grilled cheese sandwiches and hot dogs. He even served the baseball concession favorite to Queen Elizabeth upon her visit to New York. 42nd President Bill Clinton loved his chicken enchiladas. Barack Obama is crazy for his chili and is known to have a good recipe too! As for the 45th President of the United States, it looks like he loves fried food. Though Obama has since set the record straight, he was known to munch on almonds (seven, give or take a few) throughout his presidency. Kellyanne Conway wears a patriotic Gucci coat, calling it "Trump Revolutionary Wear." Melania Trump wears Ralph Lauren, confirming recent rumors. Michelle Obama dons a speckled, deep red dress with a subtle black belt. Soon-to-be First Daughters Ivanka and Tiffany Trump wear cream and white, respectively. Former Democratic presidential candidate Hillary Clinton arrives in a Ralph Lauren pantsuit. Dr. Jill Biden goes bright with her pink dress -- pairing it with subdued grey pumps. Former First Lady Laura Bush covers a light blue ensemble with a trench coat. Lara Trump wears the gray "New Jacky" wool coat by Joseph. Ivanka Trump and her husband Jared Kushner at the Inaugural Ball, Ivanka wearing a sparkling Carolina Herrera dress. First Lady Melania Trump wowed in white at the Inaugural Ball, wearing a dress she co-designed with Hervé Pierre. Will Donald Trump go for gold when decorating the White House?